I hope so because COMET TV has so many cool things in September! COMET TV is the new home of the cult classic Space: 1999! The out of this world series starring Martin Landau is a fun retro adventure, you’ll love! And we want to give you the opportunity to have an awesome September of your own! The COMET TV and CHARGE! 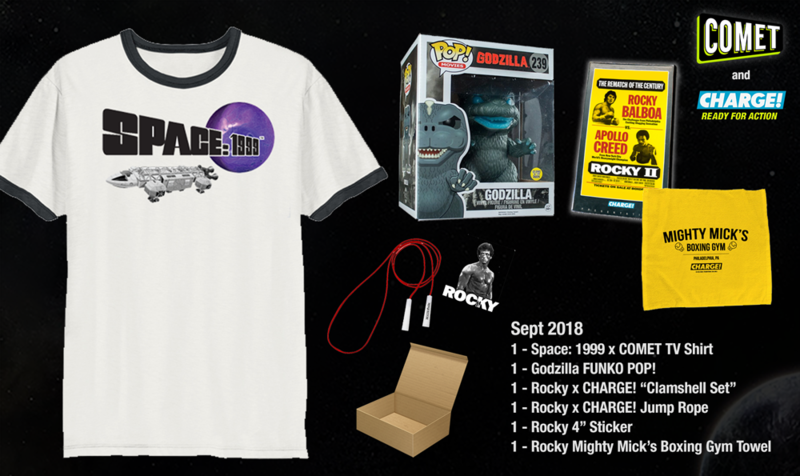 September Prize Pack is perfect for bingeing some classic films and TVShows! 1- Rocky Viewing Kit: When you’re working up a sweat in the gym and feeling the Eye of the Tiger, this kit will help you get into the Rocky mood. There is a Charge jump-rope, a gym towel, and a die-cut Rocky sticker! 1- Godzilla Funko Pop Figure: Who doesn’t love Funko Pops?!? This Godzilla will be the fire-breathing center of your collection and a perfect way to celebrate the Godzilla double features, Sundays on COMET TV! This promotion is open until September 27, 2018, at 11:59 pm EST and is limited to US residents, 18 years or older. The winner will be chosen randomly. Winner must respond to email within 24 hours or prize may be forfeited. Promotional content and prize for this promotion is provided by and shipped by the sponsor and/or its representatives. The prize may be sent via FedEx or UPS. No P.O. Boxes. My favorite movie listed in this post is Rocky. The first one is such a good movie. Rocky is my favorite movie form the list! Godzilla….ok, I know I am a total geek…but I love big green monsters. 🙂 Thank you. Space: 1999 is my favorite. I am a big fan of Rocky. Well, it’s not a movie, but Space 1999 is my favorite show mentioned in this post. The first season was great and I own it on Blu-ray. The second season, not so much, but still fun for the miniatures and special effects. Thank you for the fun giveaway. My favorite movie listed on this post is Space: 1999. Any from the “Rocky” series! My favorite movie that was mentioned is Godzilla. Thank you for the giveaway! Godzilla is my favorite of these movies! I LOVED, LOVED, LOVED Space:99. My favorite movie is Rocky, such a classic in so many ways. Rocky is my favorite movie. My favorite movie you mentioned is Godzilla, have always loved it. Thanks for hosting! I’m a HUGE Rocky fan!!! My favorite from the ones listed is Godzilla! The first Rocky movie is my favorite. Best underdog story ever. Favorite movie listed here is Rocky. My favorite movie listed is Godzilla. Rocky is my favorite movie in this post! Godzilla is my favorite movie from the list. It’s a classic that my kids have enjoyed as well. Godzilla is definitely my favorite. I really like the Rocky movies. I love Rocky and I also love Godzilla. Rocky was great when it came out. Godzilla…all of them…the classics through the remakes. Rocky is my favorite movie form the list. Rocky is an American classic! How can I choose any other? Rocky is such a classic. Everyone needs to see it. BUT I remember Saturday afternoons watching Godzilla with my mom and sister. Those memories make Godzilla my favorite. I like Rocky movies, especially the one where Rocky has to avenge Apollo Creed…is that Rocky 3? I love all Godzilla movies! I enjoy the Rocky movies the best. Rocky is the best movie, no doubt about it.